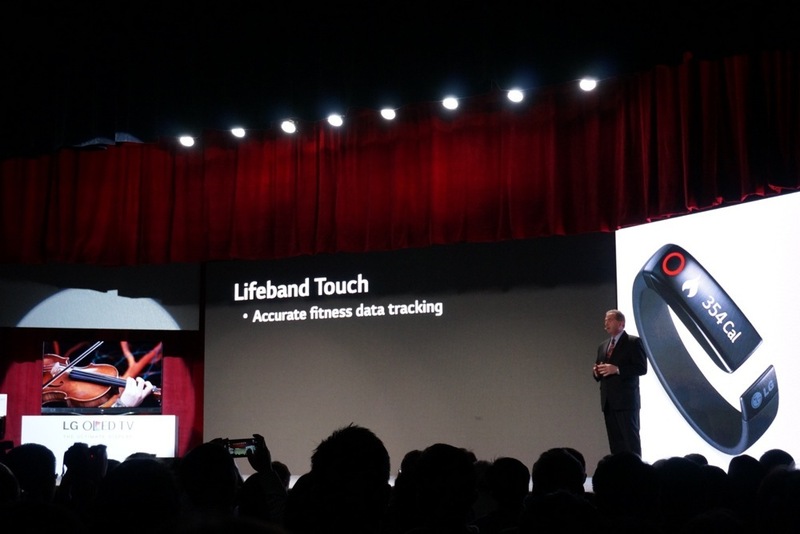 During its CES 2014 press event, LG announced a new member to the wearable community, the Lifeband Touch. As the name semi-suggests, this is a fitness tracker. In fact, it looks a lot like Nike’s Fuelband or the product that LG tried to introduce at last year’s CES and is slated to launch this Spring or “first half” of 2014. The Lifeband Touch features a touch OLED panel to display time, biometrics, incoming calls and music controls. It has a built-in 3-axis accelerometer and altimeter to help it accurately measure your activity, including speed, steps, carolries consumed (what? ), and pace. All of this info can be viewed with the swipe of a finger on the touch display. The Lifeband Touch is compatible with Android, so we should see an app to help track your fitness goals. Alongside, LG also announced Heart Rate Earphones that work seamlessly with the Lifeband Touch to make you the most health monitored person on the block. LAS VEGAS, Jan. 6, 2014 — LG Electronics (LG) today took the wraps off LG Lifeband Touch and LG Heart Rate Earphones, two wearable products that mark the company’s first foray into fitness tech. Unveiled at the 2014 International Consumer Electronics Show (CES) in Las Vegas, both products incorporate comfortable designs and compatibility with other devices so that monitoring one’s health requires no additional effort beyond strapping on a watch and inserting a pair of headphone earbuds. Lifeband Touch is a smart activity tracker that incorporates a bold yet comfortable designand is compatible with heart rate monitors (HRM) as well as smartphones. Meanwhile, the innovative Heart Rate Earphones’ unique dual-function design offers a convenient way for users to measure their heart rate while exercising . Both devices are designed to help users take greater control over their health. Lifeband Touch and Heart Rate Earphones can wirelessly link up toeach other, creating a seamless wearable ecosystem. Connected to smartphones (Android and iOS supported), the devices can transmit data to the intuitive, easy-to-use LG Fitness app, or to a number of other third party apps such as MyFitnessPal, Runkeeper or MapMyFitness. Lifeband Touch was designed to be asymmetric and flexible, providing greater comfort and style than other wearable fitness wristbands. Featuring a touch OLED panel to display time, biometrics, incoming calls and music controls, the built-in 3-axis accelerometer and altimeter allows the device to accurately measure key performance indicators such as distance, speed, number of steps, calories consumed and projected pace. All this information is visible with a swipe of a finger on the OLED display. Engineered to be lightweight and simple to use, it incorporates a unique motion-sensing algorithm that automatically turns on the display when the wearer rotates his or her wrist. Lifeband Touch also offers wireless connectivity via Bluetooth to transmit data to a smartphone or receive data from third party devices such the Heart Rate Earphones. LG’s Heart Rate Earphones feature PerformTek® sensor technology which measures blood flow signals from the auricle, the external part of the ear to capture accurate biometric data such as heart rate and maximal oxygen consumption (VO2 max). As a continuous heart rate monitoring device, PerformTek® has proven accurate during rigorous physical activity. LG employs a flexible ear piece design to make its Heart Rate Earphones more comfortable to use than other similar monitoring devices. A clip-on medallion connected to the earphones provides Bluetooth connectivity, enabling the unit to send data to a smartphone or the Lifeband Touch for a truly seamless experience. Lifeband Touch and Heart Rate Earphones will be available starting in the United States in the first half of 2014, to be followed by rollouts in other markets. Visitors to LG’s booth at CES 2014 (Las Vegas Convention Center, Central Hall #8204) from January 7 through January 10 will be able to see and experience LG’s newest wearable devices for themselves.